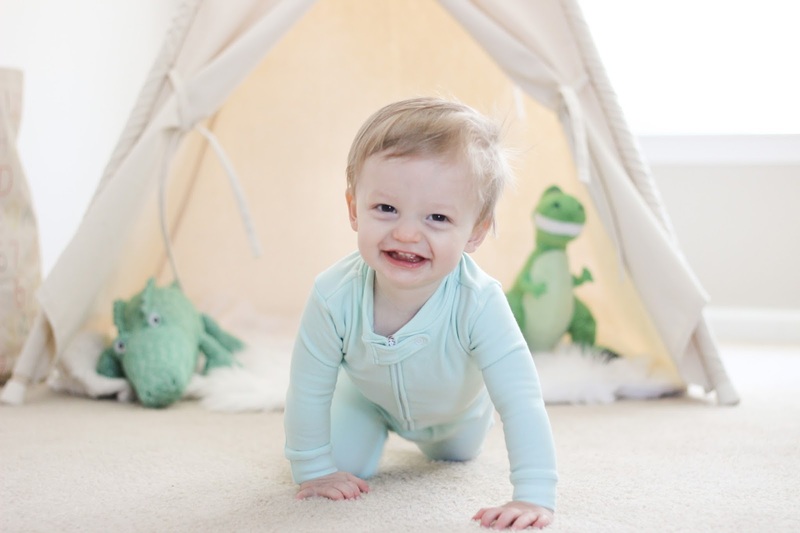 As a mama and lover of supporting small businesses, I feel like its my duty to make sure every mama, soon-to-be mama, future aunt and grandma hears about the softest footed sleeper EVER made. Like, so soft that I'm waiting for the day Softsie makes adult pajamas and I will literally never take them off. I've been pretty picky about which small businesses I work with lately but I couldn't be more excited to share this one with you. We're several washes into the life of this Softsie footie but it still feels like the softest thing ever. It actually feels cool to the touch too because each is infused with aloe vera, jojoba oil, and vitamin E.
The infusion process is all-natural and fragrance-free, so its perfect for babes with sensitive skin. You can read more about the infusion process here (call me a nerd but I think its really fascinating) and I'm so impressed with Natalie, the brains behind the brand, for coming up with this idea. 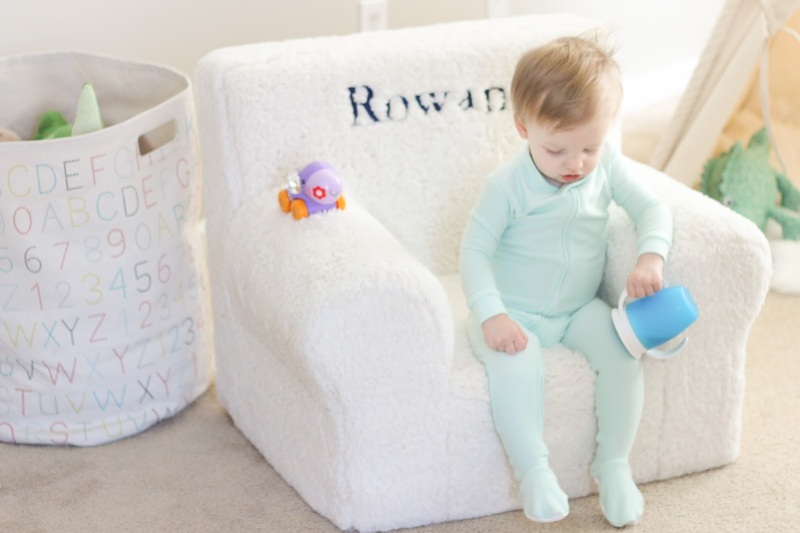 We've racked up quite the collection of footed sleepers by now because that's the only thing that Rowan wears to bed, but this Softsie sleeper is on major repeat especially on the cooler nights. I'm kicking myself for not knowing about these when he was a newborn with all of that dry skin! And because I have a hunch you're wondering what I did- like is this thing going to require extra effort during the laundry process because who has time for that? Not to worry, Softsie footies can be washed like normal and put in the dryer. Praise hands! I think these footies would be a hit for baby showers! For reference, Rowan is wearing a 12-18 month size which is pretty similar sizing to other big brands. If you know any mamas with babies who have eczema, please share this info with them! Natalie came up with this idea because her daughter developed eczema that only got worse with the dry weather of winter, so she knew the best thing to do was keep her baby girl's skin moisturized. Plus for every footie sold, Natalie is donating a dollar to the Pay it Forward Fertility Foundation. So sweet, right?! I was provided a sample for the purposes of this review. As always, my thoughts and opinions are my own. Thank you for supporting the brands that make Home Sweet Ruby possible! What an awesome concept! Camden had eczema for about the first 6 months or so of his life and it didn't help that he was a winter baby. These would have been perfect for him and we still love footie PJs! Love the mint color! I need to look into this brand because my boys have such dry skin and they would be perfect for my nephew! Thanks for sharing. PS-Rowan is so cute and getting so big! Such a cutie! This really does look so soft. I really need to get this for Wyatt...he has the worst eczema and I bet this would help.